The boatbuilding industry holds a trade show every year called the International BoatBuilders’ Exhibition & Conference, or IBEX. Although there are few boats on display, the show floor is filled with vendors selling the stuff used to manufacture them — fiberglass reinforcements, resins, electronics, windshields, seats and so on. Just as big a draw for the boatbuilders, surveyors, naval architects and engineers who attend are the seminars on the latest developments in hull design, construction and repair, propulsion systems and more. I was asked to help conduct several seminars, including one on semiplaning boats. 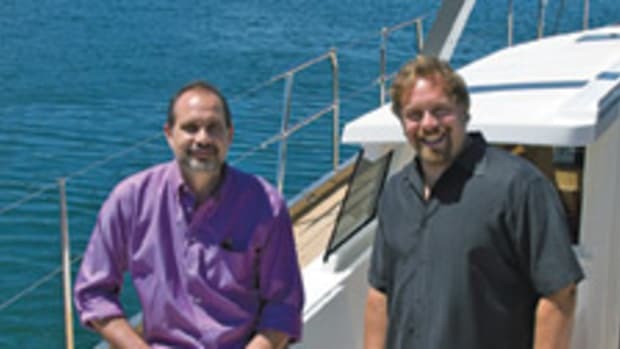 What you’ll read here is based on that seminar for which I was joined by Steve Dalzell, the chief naval architecture instructor at The Landing School in Arundel, Maine, and Winn Willard, vice president of C. Raymond Hunt Associates in New Bedford, Mass. You may be wondering what a semiplaning, or SP, hull is and why you would want one. The easy answer is that it’s precisely the same as a semidisplacement hull, only with a glass-half-full optimist’s perspective. The semiplaning hull form is a gray area perhaps best described by what it’s not: It’s not designed for optimized performance as a displacement or planing hull. So let’s first look at what it’s not. From my previous columns on hull design, you’ll recall that a displacement hull is supported by buoyancy throughout its speed range. The hull shape is designed to glide, pushing the water aside as it moves along. Its shape is designed to minimize wave-making resistance, with round bilges and upswept buttocks that reduce drag in its speed range. The longitudinal center of gravity (and buoyancy) is very close to the center of the hull lengthwise. Adding weight to a displacement hull has comparatively little effect on efficiency, and it takes very little power to move one — up to a point. The deep hull can be very stable and, therefore, more seaworthy, because the center of gravity can be very low. This is especially so with a displacement sailboat that has a lead bulb at the bottom of its keel. Because a displacement hull can only move through the water and cannot climb on top of its bow wave, its speed is limited to that of an open-ocean wave of its waterline length. The longer the wave, the faster it can go because its gravity-driven speed is roughly a function of its square root times 1.34. In other words, a wave in deep water (shallow water causes a wave to build and slow down) that’s 36 feet from crest to crest will move at 8 knots, a 100-foot wave at 13.4 knots, a 400-foot wave at 26.8 knots and so on. Given enough power, a displacement hull can reach the same speed as a wave of the same length, but to go faster it would have to climb up and overtake its own bow wave, which it is physically incapable of doing, given its non-lift-producing shape. Keep it throttled back to a speed-to-length ratio of 1 and efficiency will be very high for the displacement. Keep in mind that if you want to cruise at, say, 10 knots, a boat that’s 100 feet at the waterline will achieve that speed with less power than a boat that’s 65 feet at the waterline running at an S/L of 1.3. From a seaworthiness perspective, the displacement hull can be the most stable of all if the CG is low enough in the hull. On the other hand, an 8- or 10-knot boat is going to have a hard time getting out of the way of a hurricane or other weather system and will need all that extra weight and stability to survive. At the other end of the support spectrum is the planing hull, which rises to the surface at speed. 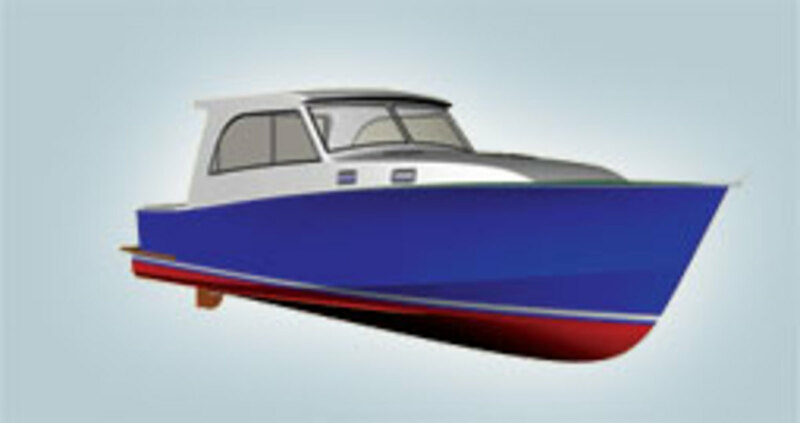 The planing hull is shaped to develop hydrodynamic lift. It has hard chines to increase the effective bottom area, thereby decreasing dynamic bottom loading, and to break solid water and spray away from the hull, which is known as flow separation, reducing drag. The buttocks are at or close to zero degrees all the way back to the transom, which produces the lift needed to raise the hull mostly out of the water. Water flow at sufficient speed takes over from buoyancy and entirely supports the weight of the hull once it reaches an S/L of more than 3. 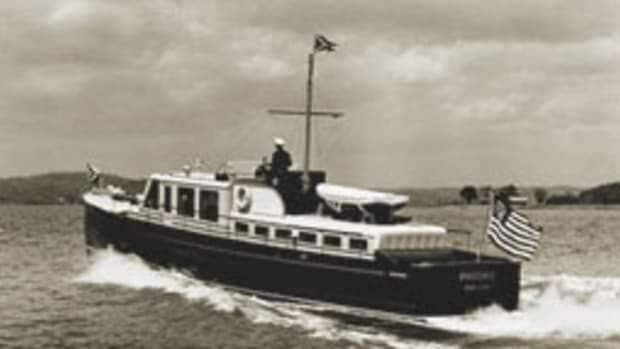 This means that once a planing boat with a static (at rest) waterline length of 36 feet reaches 18 knots, it is considered to be fully on plane, supported entirely by pressures developed by the flow of water beneath the hull. Remember that a heavily loaded boat will need more speed to be fully supported by dynamic lift and a very light boat less speed. Planing hulls are designed and powered to achieve S/L ratios much higher than 3. Consider that a 25-foot outboard boat with a 22-foot waterline length traveling at 35 knots is operating at an S/L of nearly 7.5. The longitudinal center of gravity in a full-planing hull is well aft, some 30 to 35 percent forward of the transom. This aft weight distribution encourages the forward half of the hull to completely dry out at high speed, and the lack of frictional drag forward increases efficiency and improves high-speed handling and controllability. However, the aft CG also increases the speed at which the planing hull can get on top and plane, and it decreases efficiency at speeds below 20 knots, because running angle — or trim — is higher, which means the boat is dragging a taller wake behind it. “Dragging half the bay behind her” is the Down East way of putting it. Another point to remember about a planing boat is that all the extra horsepower is heavy, as is the fuel it takes to feed those big engines. The bottom of the hull has to be built stronger to withstand the increased energy of high-speed wave impact, and that adds weight, too. The increased bottom loading works against efficiency (deeper transom immersion adds form drag, evidenced by the mile-high wake), handling (a heavier boat resists turning and is, in general, less agile), and visibility (increased trim makes it harder to see over the bow from the helm). What about seaworthiness? A well-designed high-speed planing hull that can maintain a good clip in rough water can actually be more seaworthy than a slow displacement hull if that speed is used intelligently to avoid the area with the roughest seas. That brings us to this month’s topic, although the preamble was necessary to fully appreciate what the semiplaning hull can do. Any design, whether displacement or planing or in between, has capabilities and limitations. What’s helpful is to understand what they are so you can make an informed choice about which combination of compromises produces the boat that best meets your needs. A semiplaning hull is simply one that operates in the gray region between displacement and full planing, a speed range at which the hull is supported partially by buoyancy and partially by dynamic lift. It is further made gray by the observation that a 40-foot hull at 20 knots is running at an S/L of more than 3, so it is, in fact, fully planing. But 20 knots is close to the top of its speed range, not the bottom, and that makes a very big difference in the boat’s performance, as we will see. In the simplest terms, the semiplaning hull bears little resemblance to the displacement hull, but quite a lot of resemblance to the planing hull. As such, let’s compare the semiplaning hull with its full-planing counterpart. For a semiplaning boat that routinely cruises between 12 and 16 knots, either a round bilge or hard chine hull will do the job. At 16 knots and higher, however, the hard chine is the way to go. That’s because hard chines start producing significant flow separation — deflecting water flow and spray away from the hull surface — at these higher speeds. With a round bilge hull, the water travels right up the side of the boat, sticking to it like cement and holding it back. Additionally, drag from water sticking to the hull, known as frictional resistance, increases with the square of the boat’s speed. And consider that a lobster boat hull has a full keel with many square feet of surface area increasing frictional resistance. That’s why a conventional round-bilge, full-keel lobster boat is not a good choice for cruising at more than 16 knots if efficiency is your primary objective. Of course, there are valid reasons to choose a lobster hull. First, they have such gentle motions, with none of the snap roll associated with overly beamy and flat hard-chine hulls. But that’s an extreme example; a well-designed hard-chine, vee-bottom hull doesn’t snap roll, either. 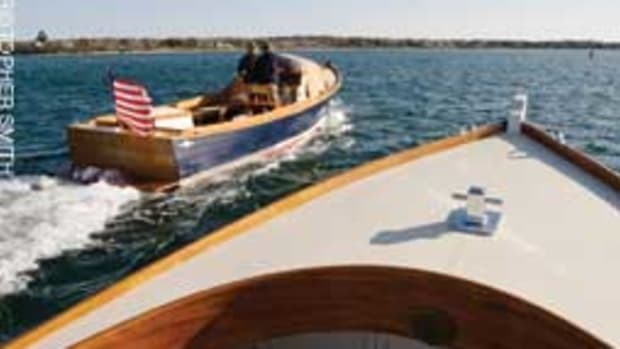 The lobster boat’s full keel also anchors the boat at low speed in a crosswind, which is really handy whether working a string of pots or maneuvering around a marina. 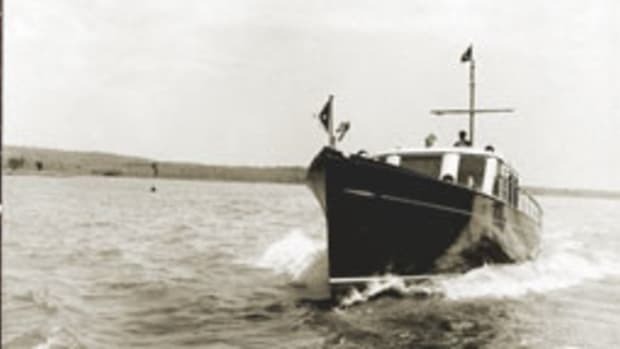 I’d much rather be graded backing a 50-foot lobster boat into a slip than a 25-foot outboard simply because the former would be so much more predictable and easy to handle. 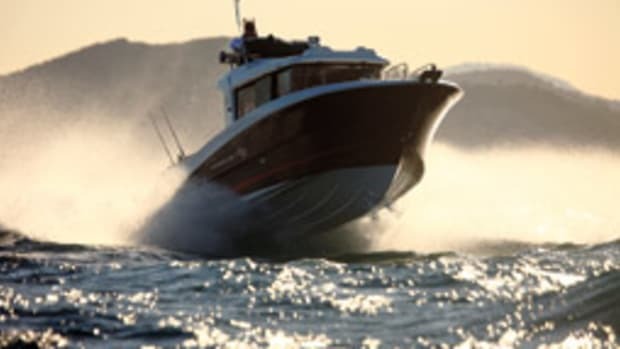 However, the lobster boat belongs at speeds below 16 knots if efficiency is a primary consideration, and you can expect a substantial increase in fuel consumption at speeds above 20 knots. In Ray Hunt’s early designs — Hunt perfected the deep-vee hull — the bottom ran transversely all the way to the hull side in a straight line. These hulls were tender at rest and heeled more in a high-speed turn, so he started adding chine flats — a 3- to 5-inch-wide flat (or slightly down-angled) section just inboard of the chines. This redistributed buoyancy outboard at rest, improving form stability, and created a high-pressure region along the chines at high speed, which raised the hull a bit more and made it more efficient, with less wetted surface. Chine flats also reduce the amount of heel in a turn and help keep the hull from spinning out at high speed. Spray strakes or rails act like hard chines, too, in that they break water away from the hull, so the area directly abaft the strake is dry, decreasing the amount of water sticking to the hull and reducing drag. The semiplaning hull should have buttocks that are nearly parallel to the waterline — in other words, the hull bottom aft should not sweep up like it does with a displacement hull. This means the transom should be immersed when the boat is at rest, and the wake should break clear from the stern once it’s going fast enough. 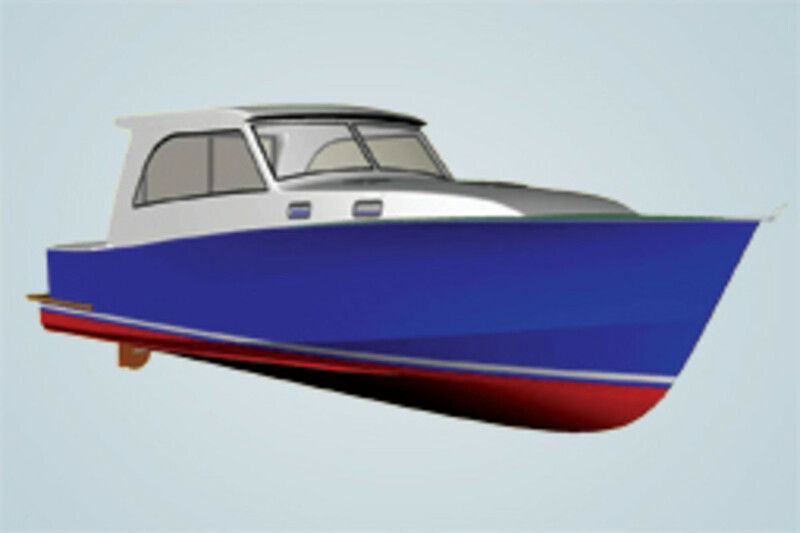 The hull sections aft, parallel to the waterline when the boat is at rest, help create the dynamic lift needed to lift the hull as speed increases and dynamic pressure increases. In this way, and in favoring hard-chine over round-bilge shapes, planing and semiplaning hulls are nearly identical. The semiplaning hull’s center of gravity can be farther forward than in a planing hull, which has substantial benefits. First, the boat can get on plane at a much lower speed. In fact, a well-designed semiplaning hull can slide right up on plane with hardly any bow rise, much like a triple-hull pontoon boat. Also, the greater the bow rise, the more the boat pounds, with a near linear (constant) relationship between trim and wave-induced accelerations. The semiplaning hull, therefore, runs flatter and more comfortably for a given deadrise, so waves have less impact (so to speak). The beam of planing boats has crept up and up through the years. We now have 40- and 42-footers with 15-foot beams — a length-to-beam ratio as high as 2.66:1, which is counterproductive at many levels. First, short and wide hulls tend to run at higher trim angles, so they drag more water along with them, increasing form drag. They also ride harder at those higher trim angles, creating an uncomfortable and eventually unsafe platform in high-speed, rough-water conditions. Visibility from the helm is impaired, and wider means more reactive to the wave gradient; they are actually too stable for comfort. A well-designed semiplaning hull has an L/B of 3.2 or more, and 3.5 or more at the waterline. Steve Dalzell’s Latitude 40, which we used as an example at our IBEX presentation, is 39 feet, 4 inches long and just 9 feet, 8 inches wide at the waterline. When it climbs up on its lower chine (it has a double-chine hull) it is a mere 8 feet, 10 inches wide at the waterline. Rather than thinking wider is better, which it is not unless you mean to stay shackled to the dock, it might help to think of a boat’s size in terms of its length, beam and height — in other words, volume. So a 45-by-13-footer is the same size as a 40-by-14-foot-6-inch boat, but the former will be more seakindly, seaworthy and efficient by a wide margin. The beamiest 40-footer gets a lot of attention at the boat show for its king-size berth and his-and-hers hanging lockers, but stand by when you get offshore. A same-size narrower hull will tend to have a decreased running trim, improved ride and decreased fuel consumption, and will handle better, be more seakindly and be a superior all-around sea boat that you will love to tinker around in. Although a hull with 24 degrees of transom deadrise is just the ticket for racing boats and 60-knot tournament sportfishing outboards, all that deadrise at the transom and the aft CG of the high-speed planing hull make it harder to get on plane. More than a few triple- or quad-outboard or sterndrive deep-vees have to reach as much as 18 knots before planing and leaving a clean wake astern, although they make up for their lack of low-speed gracefulness at 80-plus mph. A semiplaning hull can run very well with 14 to 20 degrees of deadrise aft. Flatter sections aft improve lift and decrease drag, although I wouldn’t go below 14 degrees simply because deadrise improves directional stability without adding appreciable frictional drag, as a full keel would. Hull sections forward can also be a little flatter because of the slower operating speeds. The angle of entry, or the shape of the hull’s water plane forward, cannot be too blunt. A blunt entry (found on many 30-knot boats today) will not only pound, but it also creates too much lift, raising the bow out of the water and increasing trim, with the negative consequences already discussed. These images show the deep-vee HBI 30 RIB semiplaning at 10 knots (S/L 2) and skimming along on full plane at 46 knots (S/L 9). Weight is the most critical element of a semiplaning boat. You can get the hull shape and center of gravity just right, but if the boat weighs too much, all of the other careful work goes out the porthole. The key to a successful semiplaning hull is to keep the bottom loading light. This is a three-way effort: The designer can specify laminates and scantlings that will keep weight down, the builder has to assiduously avoid weight creep during the manufacturing process and the owner can’t add too much stuff during the owning process. This means careful quality control during construction, including the resin-to-glass ratio, but it also means that you as the owner must be content with less “content,” as the builder calls it. So if you want optimum performance and efficiency you will have to settle for a smaller generator, no granite countertops, no washer/dryer, etc. — a boat that’s simpler but by no means Spartan. Happily, the very concept of semiplaning at 12 to 20 knots means the boat will be much lighter than a full-planing vessel. How’s that? Dalzell’s Latitude 40 has a single 370-hp Volvo D6 diesel and can make 23 knots, tops. In the other corner, a well-known 40-foot convertible has a pair of 800-hp MAN diesels and can hit 35 knots at top speed, but at what a price. With all that iron under the deck, a beam approaching 16 feet and a displacement of 35,000 pounds, this 40-footer gets 0.55 nmpg at 19 knots, compared with the Latitude 40’s 1.65 nmpg at the same speed. The Latitude’s single Volvo weighs 4,100 pounds less than those twin MANs, for starters. Now make the fuel capacity 300 gallons instead of 600 gallons and you take another 2,100 pounds out of the boat. At cruise, the 370-hp Volvo burns 10 to 14 gph, about 18 gph at full power; compare that with the 800-hp MANs at 50 to 65 gph at cruise and 82 gph at full power. With a displacement now 7 tons less than our Brand B, the Latitude is three times as efficient at cruising speed. Although the drag from the inboard running gear in a 35- to 40-knot hull approaches or exceeds that of the hull itself, the single Volvo in the Latitude 40, with a deep gear and larger (26- to 28-inch) prop, is every bit as efficient as a sterndrive or pod at 16 to 20 knots and offers excellent traction around the dock to boot. The tremendous drag of inboard shafts, struts, props and rudders in a conventional inboard at 30-plus knots is why inherently low-drag pod propulsion is such a better choice, if efficiency is driving the decision, at speeds of 25 to 45 knots. So we can chalk up the difference in efficiency to a number of factors: the Latitude’s 40 percent lighter (20,500 pounds) displacement, much narrower chine beam on plane, forward CG, lower running angle and still efficient inboard running gear at 20 knots. The semiplaning boat is lighter, narrower, more comfortable and less expensive to buy and own than the high-powered planing boat. You could likely buy a 40-foot SP boat for the price of a 33- to 35-foot planing boat. When you consider you can get out on the SP 40 on windy days that would keep the 35 tied to the dock, larger for the same price becomes an appealing proposition. Given the price of diesel horsepower, you could save more than $100,000 in engine costs alone between our two 40-footers, to say nothing of the cost of maintaining and overhauling them down the line. 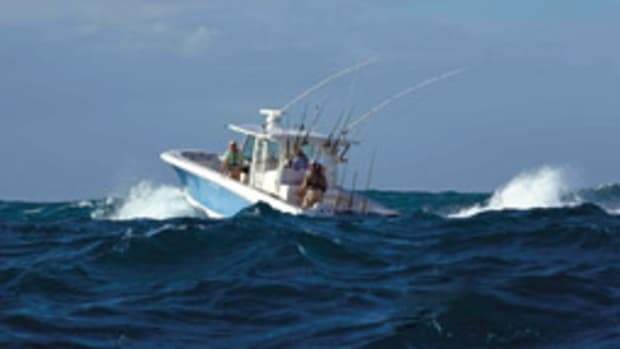 You can also cover a lot of ground in eight or 10 hours at 18 to 20 knots and, as Hunt’s Winn Willard has pointed out, you often can’t make 30 knots anyway, because real-world ocean conditions tend to slow a boat with a prudent operator. At 18 to 20 knots you can also hear yourself think, chat with the person five feet away without screaming above the diesel-and-wind din, walk from one side of the boat to the other without hanging on and generally enjoy the process of getting there. Also, consider how nice it would be to cruise at any speed you want from 1 to 20 knots. Getting over the hump in an SP is almost a non-event, so you can cruise along at 10, 11, 12 or 13 knots with little bow rise and even less complaint from your propulsion system. The Latitude 40 will be a lot less money than its 30-knot counterpart, which means you can have more boat for the money. More boat means more comfort and seaworthiness, more space and range, and so on. Just don’t succumb to the temptation to make your 20-knot semiplaning boat a 30-knot planing boat because that requires double or more the horsepower, more fuel and a more heavily built bottom, which increases bottom loading so you no longer have a boat that performs well in the SP region. That’s really the take-home from this whole discussion. A planing hull can run in the SP region, though poorly; it will be sluggish and ponderous at these speeds, with its high bottom loading, light gear ratios, small props and smaller rudders. 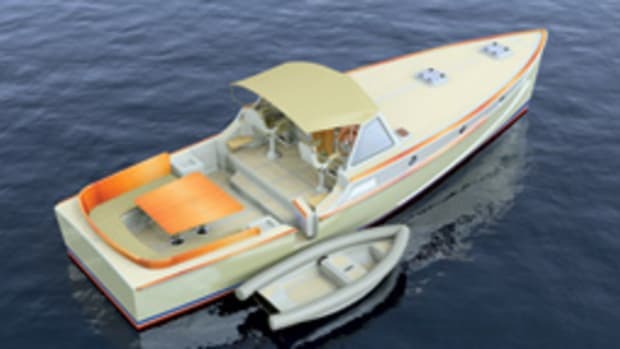 A 40-foot SP boat at 20 knots is fully planing and, because it has a lower-horsepower engine, carries less fuel, is more simply outfitted and has lighter hull scantlings it’s as agile as a cat in this realm. Simplicity has other rewards, too — not as much stuff to break and maintain means more time cruising and less time fixing. 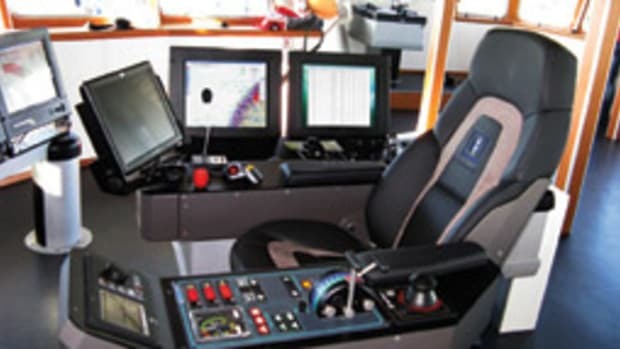 You can get a bow thruster if single inboard power worries you — and joystick control if you add a stern thruster and integrate the main engine. It’s still a lot less weight and cost than twin diesels. And one small diesel instead of two big ones means more room for a second or third “cabinette” below the saloon. With the world trying to pull out of the Great Recession, and people’s attitudes about money, environmental responsibility and legacy (what kind of example am I setting for my kids), the time is right for semiplaning boats.